A family curse - a genetic trick resulting from centuries of hardship - causes the Hervé children to be born either giants or runts. Book One follows the giants' line, exploring Jude Hervé's career as a boxer in Georgia and Louisiana in the 1960s, his escape from that brutal life alone with his baby daughter Isa, and her eventual decision to enter into a strange, chaste marriage with a much older man. Book Two traces a different kind of life entirely, as the runts of the family discover that their power lies in a kind of unifying love. François seeks the identity of his missing father for years, while his own son, Harvey, flees from modern society into spiritual quests. But none of the Hervés can abandon their longing for a place where they might find others like themselves. In assured and mystically powerful prose, Deni Y. Béchard tells a wide-ranging, spellbinding story of a family trying to create an identity in an unwelcoming landscape. Imbued throughout with a deep sensitivity to the physical world, Vandal Love is a breathtaking literary debut about the power of love to create and destroy - in our lives, and in our history. Even when Jude was a boy, his arms and legs bulged, his neck corded, his muscled gut humped beneath his chest. On the steep fields above the road, above the river so wide they called it la mer, he worked in clothes the color of dirt, harder and fasterthan his uncles, though when he paused from digging, he stood awkwardly, uneasy with inaction. By the age of fifteen, he rarely stopped. He sat and ate in the same motion. He undressed and stretched on his bed and slept. Hardship had given his face the uneven angles of an old apple pressed in among others in a cellar crate. He'd never closed his eyes to wonder at what couldn't be seen. How does Vandal Love explore movement and what it does to people? What values are lost - or cemented - in migration? How do the novel's characters variously distance themselves from the past or try to recreate it? Why does Isa-Marie take to her bed after Jude attacks her young friend? Do you think Jude felt guilt over her death? In what ways do love and destruction co-exist in this section? What other patterns of love twinned with destruction can you trace within the novel? Elements of Béchard's novel have a magical realist quality - the extremes of the characters' sizes, their prodigious appetites, the coincidences that bring them together. Its idiosyncratic characters and darkly strange worldview, however, will remind many readers of the gothic atmosphere of Joyce Carol Oates's novels. It's hard to believe that this skilled, often deeply moving novel is Béchard's first - readers will certainly be hoping for great things from this imaginative, original, elegantly lyrical but muscular new voice. (Reviewed by Norah Piehl). Don't think of Vandal Love as a page-turner. It's a novel you'll want to read slowly, savoring prose that's both lyrical and gritty, able to evoke big emotions with exquisite intimacy. A family mythos reminiscent of Faulkner. Starred Review. Reportedly at work on a book about conservation in the Congolese rainforest, the author clearly has ambitions as big as his talent, but readers of this lyrical novel will hope he gets back to fiction soon. Starred Review. [A] moving and entertaining debut... Though Béchard (Cures for Hunger, A Memoir) has a journalism background, this fiction debut, unfolding in punchy prose, recalls Márquez with a French-Canadian twist. Although Vandal Love is a first novel, it reads as smoothly as if Béchard had a library to his name - mature, lyrical, tactile and at times simple, cruel and sweet. No doubt, the giant steps this young writer has taken will set him far ahead on his literary path. Deni Y. Béchard surpasses Kerouac in his consciousness of the French as part of a larger people, how their struggle is socially and politically situated rather than strictly personal... Vandal Love seems like a trans-generational On the Road, which, also infused with a kind of inherited defeatism, was the perfect Americanized expression of an unexamined Existentialism, the ultimate Beat utterance. Béchard's writing, at its strongest, flows in sonorous passages, evokes memorable landscapes, natural and urban, examines the enduring qualities of a family separated by both time and distance, and contains echoes of the magic realism of the South American master Gabriel García Márquez. Although some elements of Vandal Love seem mystical or even supernatural in their origins, one significant theme of the novel is very much rooted in history. 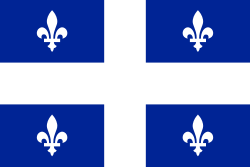 Early in the story, Hervé - Jude and François's father - expresses disgust with the mass migration of Québécois away from the country of their birth, a journey of which his own children will soon take part.